350 Brooklyn – [9.12.17] Can you be there on Thursday to tell the Governor he must lead on climate? September 14: What is Governor Cuomo doing, and not doing, on climate? The unprecedented strength of Hurricanes Harvey and Irma have demonstrated vividly the destruction climate change can cause. Yet the Trump Administration is gutting the Environmental Protection Agency and sacrificing our future for the benefit of fossil fuel industry profits. In this new reality, New York and other progressive states must take the lead in fighting climate change and building resilient communities. Governor Cuomo has the power to make New York City a world leader on climate change. And while he has taken some positive steps, he can and must do more. At our general meeting on Thursday, we’ll have the chance to speak with Counsel to the Governor, Alphonso David, and Venetia Lannon, Deputy Secretary for Environment, and let them know we demand real leadership on climate. Join us! Can you be there? Tell us on Facebook and invite your friends today. Read more about the Governor’s record, the good and the bad, below. On October 24, join 350Brooklyn as we hold our legislators accountable and hear from experts who can help us chart a path forward. Speakers are slated to include: Karen Blondel from Turn the Tide, Priya Mulgaonkar from New York Environmental Justice Alliance, Sean Sweeney of the CUNY Labor, Climate and Environment Program, representatives of the New York Renews coalition. Can you help us prepare for the event? Email Ari at ari.r.lieberman@gmail.com. Last Week, US representative Tulsi Gabbard introduce OFF Fossil Fuels for a Better Future Act (HR 3671). The bill requires the US to get 100% of its energy from renewables by 2035. This is the strongest piece of legislation on climate ever introduced into Congress. Every member of congress needs to hear from their representative about this bill, and why it is necessary to prevent climate chaos. Learn more about the bill and what you can do here. · In 2014 he banned fracking in NYS. · In April he began to require the six investor-owned utilities in NYS to purchase Zero Emission Credits that are designed to keep upstate nuclear power plants afloat. · NYS participates in the Regional Greenhouse Gas Initiative, a program that requires the steady reduction in carbon emissions from power plants—by 2.5% per year through 2020 and by 3% per year to 2030. · The New York State Energy Research Development Agency (NYSERDA) is vigorously pursuing a variety of initiatives that support the development of renewable energy in NYS, like offshore wind, battery storage, and geothermal heating systems. · He has supported the construction of new fracked-gas power plants, despite vehement opposition from local communities. · Construction of the CPV power plant is well underway in Orange County, and in June, construction of the Cricket Valley power plant began in Duchess County. Both of these will be huge, seriously polluting the surrounding air. 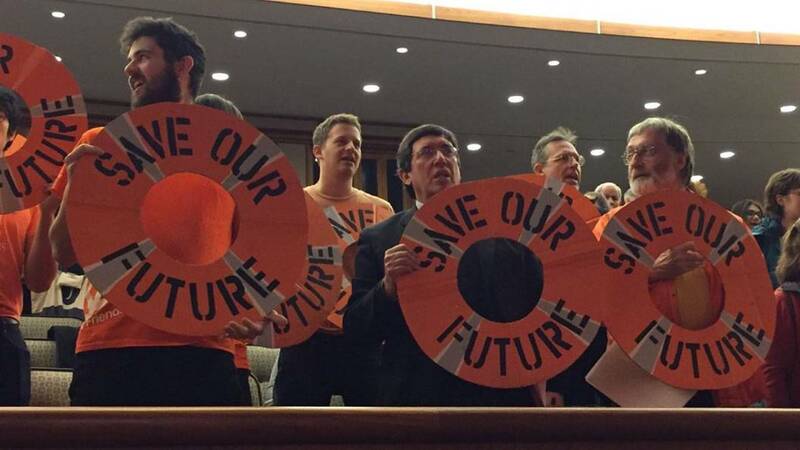 · He has now proposed to retrofit an old steam plant in the Sheridan Hollow neighborhood of Albany as a fracked-gas power plant. · While fracking is banned in NYS, the waste products of fracking—a sludge of water polluted with a stew of proprietary-secret chemicals—are routinely sent to waste dumps along the Southern Tier of New York State. · Pipelines, with their attendant air-polluting compressor stations, that carry the fracked methane gas to market, have been allowed to be built in New York State. The prime example here is the Spectra Pipeline built across Rockland and Westchester Counties (and so under the Hudson) to carry fracked gas from Pennsylvania to New England. New York State does have the power to stop such pipelines. We hope you’ll show up on Thursday to help us keep Governor Cuomo accountable as we make New York a leader on climate.